This one’s done! It’s still busy and it still makes me a little dizzy, but as expected, I am liking it more now that it’s completed. For those who may not have seen the original post about this quilt, this is my take on the bento box quilt. I thought it might add a little interest to add a few more pieces to each block and to change the width of the strips a bit. A tutorial is posted here on the way I constructed these blocks. The binding is a great turquoise stripe from the Lizzy House Red Letter Day line. And I’ve already shown you the back, but here it is again. I wanted something simple, since the front is kind of busy, so these wide solid stripes seemed like a good idea. Of course I couldn’t resist adding in just a few other pieces of some of the prints from the front! This entry was posted in [search] Other Quilts, 2009 Finished Quilts, Finished Quilts, Household Sewing - bags, napkins, pillows, Posts about Quilts, Quilts and tagged bento box, free motion, handmade, meandering, modern, modified, quilt, quilting, stripes. Bookmark the permalink. 54 Responses to It’s finished! A modified bento box quilt. and the quilt’s not bad either. The rugby stripes definitely help to calm down the dizzying effects of the front. This is gorgeous…I’m on the edge of my seat waiting for that tutorial! Beautiful. 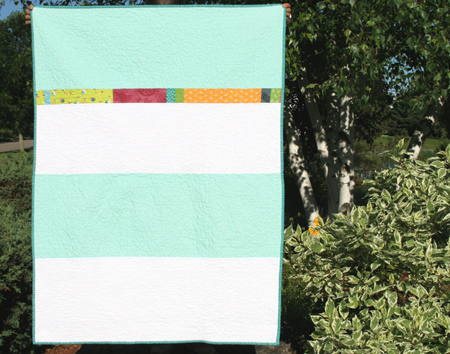 This is a perfect example of how quilting really makes a quilt top shine. Love it. Its even more fabulous quilted!! Can’t wait to see the tutorial – I may try it on a quilt back for my present project. The all over meander quilting really tones down the business. It looks great and so colorful! I love it! Can’t wait for the tutorial!! Love the quilt and your picture with the flowers in front of it. I can’t wait to see your tutorial. I love that it has a lot of energy to it!! i love how it turned out, and the colors are gorgeous together!! another great one, ashely!! you always amaze me!! one question. do you graph all your quilts before you start? there is always such balance, and just wondering if you piece as you go or if you have it all graphed out. it’s lovely ashley! and I spot some green gnomes there! I really love the optical illusion that is created…it makes me dizzy and I’m not complaining! I love this! I’m so glad you’re posting a how-to, this will be perfect for the twin-sized quilt I want to start soon. It’s a great quilt. So happy you will be telling us how you constructed it. Gorgeous, I love all the colors! LOVE IT! Those colors are amazing. Well done. i LOVE this quilt ashley, and may just have to copy it!!! So stunning. 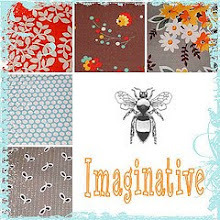 You are an amazing quilter! I will look forward to your tutorial. Just. Love. It. So. Much. The photography with the flowers is amazing as well. i love it! especially with all those flowers. Fantastic take on the bento..the differing widths give the quilt some ‘spark’. Love it! I love it! It doesn’t look too busy in the photo, and your fabrics work well together. I’d love to give this pattern a try. Wow, it’s really beautiful! I love the movement of the colors. And I love that narrow patchwork across the backing, making it fun and fresh. Ashley, I’ve been following your blog for a few weeks. 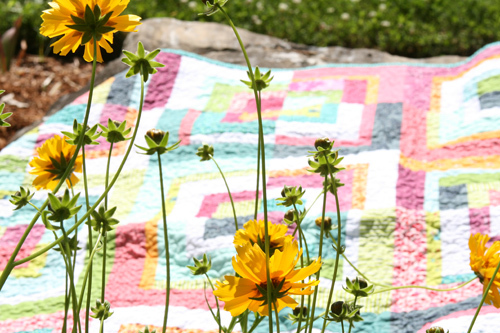 Each new quilt is more inspiring and stunning than the one before. This one makes me think of a perfect summer day. . . Not sure what you do in your “real job”, but quilting certainly seems to be your calling. . . . I see a book in your future . . it’d be a winner! Beautiful!!! And I do love the color of the binding! It just brings everything together! Wow, it looks fantastic! So fresh and springy! Thought you didn’t feel like quilting in the summer, but I must say I am stunned. About the speed with which you put new quilts together and about this quilt specifically. Just love it! Enjoy your time quilting! I love this quilt! I can’t wait for the tutorial!! The bento quilt is on my list- but your modified bento might have just taken its spot! Amazing. I think it should be called ‘vertigo’ for it’s dizzying effect and it kind of reminds of the graphics usually seen at the start of an Alfred Hitchcock movie. A lovely quilt! I really, really, really love this quilt. Can’t decide if it’s the colors or the pattern. Maybe a combination of both. I can’t believe how much I love this quilt! I don’t know that I would ever have put so many colors together like that, but it is just calling out to me to make one. SO gorgeous! Okay, so what I meant was that I wouldn’t have THOUGHT of putting all those colors together, but they look fabulous together! i love the back!!! i need to stat making my backs more creative! lovely quilt! and congrats, you’ve won some fabric!! get in touch so I can send you your goodies. this quilt is amazing! what a beautiful finish! thanks for all the inspirational work. I love all of the quilts. They all have a special charm. How was sewing the double gauze hexagons? did the material stretch a lot. I’m going to start a quilt with double gauze but my sewing teacher recommended I do all the piecing by hand to keep it soft. what do you think?! looking forward to hearing your thoughts. AHH…I have tried to make this blanket twice and always in the end I end up not getting any of the lines straight and equalling up together! I thought I was measuring very well and my seaming are almost right one. Is there a trick or anything or something that I am doing wrong? Is it harder with so many strips should I try to regular one? I don’t know what else to try with it, and frankly it is really discouraging. This my favorite quilt of all time. I love the colors and uneven strips. Not too busy at all. Just gorgeous!!! Thank you for posting the tutorial to this as well. 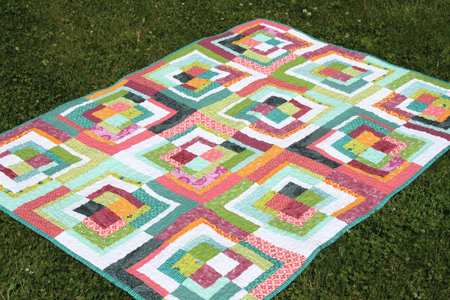 I’m hosting my quilting bee this month, and we’re using your tutorial to make my quilt! Your work is beautiful. Hi! I just ran across this page when looking for a new quilt pattern to try after almost 10 years of not piecing at all. I have one question about it, in case you are still checking comments on this quilt: Is there any way to offset the seams? I’m worried that the seams will be too bulky where they meet, if the seams aren’t going opposite directions. Thanks! Hi. 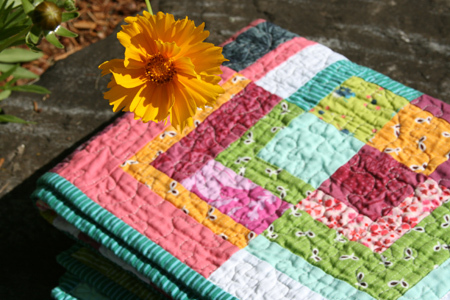 Ive just come across this quilt and have loved making the Modified Bento Block. 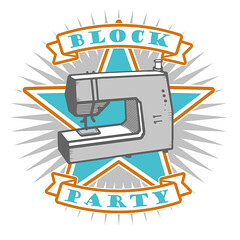 I set blocks for a charity quilting Bee (beeblessed2.blogspot.co.uk) which some of the quilting bloggers make up and post to us in Northern Ireland. I would love to set this for April and link to you. I hope that’s ok.